Wednesday - Friday: 8:30 a.m. - 2 p.m.
Saturday & Sunday: 8 a.m. - 2 p.m. Afternoon Tea begins at 1:45 p.m., reservations required. 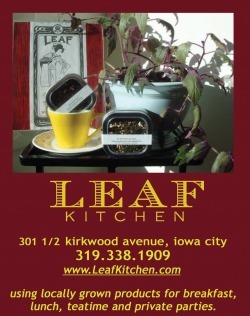 Leaf Kitchen Voted 'Best Chef/Restaurant' in Iowa! We're proud to announce that Leaf Kitchen has been voted Best Chef / Restaurant by the readers of Edible Iowa River Valley magazine. 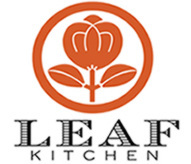 Leaf Kitchen is the first Iowa City restaurant ever to win this prestigious award. Last year’s winner, a Des Moines restaurant, went on to win the James Beard Foundation award, the country's most coveted honor for chefs. Call us at (319) 338-1909 for afternoon tea reservations. Our aim is to continue providing the Iowa City area with a unique—and delicious—dining experience. Bon appétit! Join us for lunch, brunch or afternoon tea. 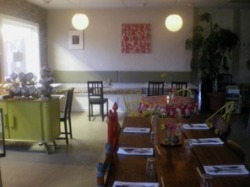 Gourmet teas, coffees, homemade foods and pastries. We use locally grown and raised ingredients whenever possible. Follow us on Facebook and Instagram to see our latest specials!